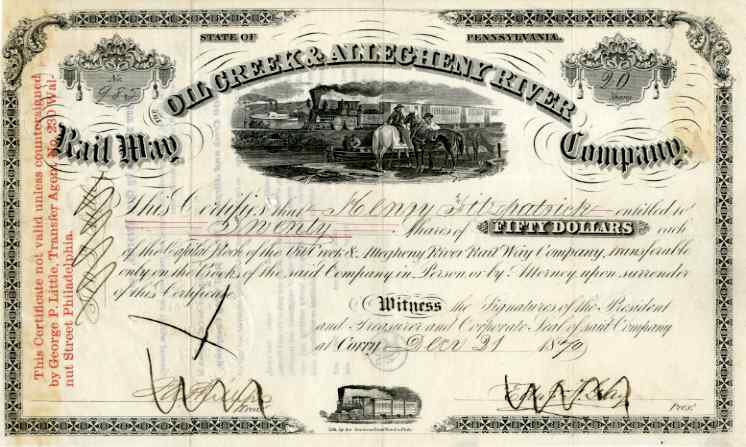 1870 Oil Creek & Allegheny River RW Stock Certificate. Attractive scripophily document with vignette of men with horses with train and paddle river boat. Second small vignette of train at bottom. The Oil Creek Rail Way was chartered in 1860. In 1868 it merged with other short line oil railroads in western Pennsylvania to form the Oil Creek and Allegheny River Railway.Ê This 6-foot gauge railroad was designed to transport oil from the oil regions of Venango County, PA to Corry, PA. and Oil City, PA. It first transported oil in wood barrels on ÒflatsÓ or in converted stock cars.Ê Later, in 1865, it utilized the Densmore two-tank oil tank car (two vertical oil tanks on a flat car).Ê Starting in 1867, the horizontal iron tank car came into use and the vertical tank car shortly became obsolete. Certificate VF+ with pen cancellation of signatures.